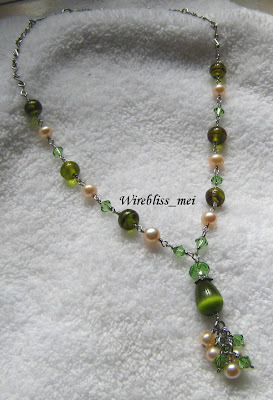 Today, I finally got this commissioned green themed necklace done! This is really slow, considering I have all the beads and wire ready since last weekend. I used 25g stainless steel wire for the wraps and 20g for the chain. The length of the necklace is about 16 inches, while the pendant from end to end is about 2 in. 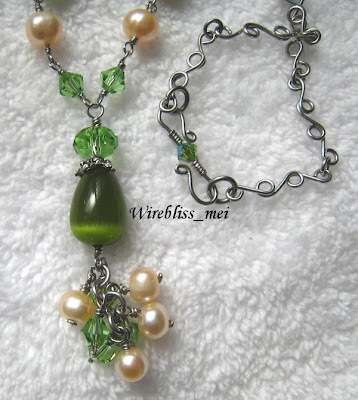 Just wondering what material is the wire you use for making Jewelery. My wife loves your designs but she's allergic to certain metals. Unless where specified, I use stainless steel wire about 99% of the time.